ONE Time Only This Year for PBL! The time for Project Based Learning has come, and SY 2017-2018 there will only be ONE offering. The experience of thousands of teachers across all grade levels and subject areas, and research, confirms that PBL is an effective and enjoyable way to learn - and develop deeper learning competencies required for success in college, career, and civic life. Why are so many educators across the United States and around the world interested in this teaching method? The answer is a combination of timeless reasons and recent developments. PBL makes school more engaging for students. PBL builds success skills for college, career, and life. PBL provides opportunities for students to use technology. PBL makes teaching more enjoyable and rewarding. PBL connects students and schools with communities and the real world. The PBL 101 Workshop is BIE’s foundational three-day (consecutive, 7.0 hours per day, including lunch) onsite workshop. Based on BIE's model for Gold Standard PBL, the workshop provides participants with the skills and knowledge needed to design, assess, and manage a rigorous, relevant, and standards-based project. The workshop models the project process. Facilitated by one of BIE's expert National Faculty, the workshop is a balanced blend of direct instruction, video analysis, hands-on work, resource sharing, and peer collaboration and feedback. Participants are actively engaged in project design, with the expectation that every teacher or teaching team will generate a project plan that receives formative feedback from both participants and BIE National Faculty. Please see guide signs when you enter that will show you to the classroom. None. T&L will cover the cost of your registration and your subs. Please complete the below Google Form to register. PBL 101 will accept up to 35 participants. 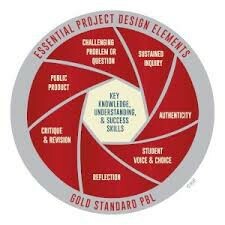 “This is a great training to help you learn the process of creating a PBL. You also have the chance to create one and get valuable feedback."